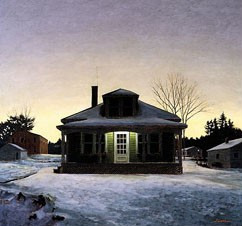 About his painting, Frederick said, "The magic hour;when the inside and outside is equal;holds a fascination for me. There exists a sense of pause and waiting which gives one an extraordinary mood." Linden studied at the Ontario College of Art in Toronto, as well as one year in Florence, Italy. His work is shown exclusively at the Gerald Peters Galleries in Santa Fe, NYC and Dallas.